The University of Missouri Division of Animal Sciences showcased its diverse research and strong graduate student programs during the Thompson Research Center field day, which was held on Monday, Sept. 17. The presentations throughout the evening were primarily led by graduate students, each of whom shared their research and work. The University of Missouri Division of Animal Sciences showcased its diverse research and strong graduate student programs during the Thompson Research Center field day, which was held on Monday, Sept. 17. The presentations throughout the evening were primarily led by graduate students, each of whom shared their research and work. “At the Thompson Research Center, we have a great opportunity to work closely with many students in the Division of Animal Sciences,” said Farm Manager Jon Schreffler. “We always appreciate when they share their research and results at our field day. With its evening format, the Thompson Research Center featured a short wagon tour through a forested … Expand ▸With its evening format, the Thompson Research Center featured a short wagon tour through a forested area of the Center. 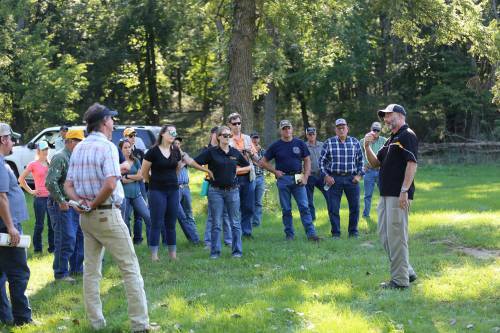 Dusty Walter, director of natural resources with CAFNR’s Agricultural Research Centers, led the tour and discussed the current timber management work taking place at Thompson. With its evening format, the Thompson Research Center featured a short wagon tour through a forested area of the Center. Dusty Walter, director of natural resources with CAFNR’s Agricultural Research Centers, led the tour and discussed the current timber management work taking place at Thompson. After a short welcome from CAFNR Vice Chancellor and Dean Christopher Daubert, Emma Knickmeyer, a graduate research assistant, discussed using split-time artificial insemination with estrus synchronization protocols in heifers. Jordan Thomas, an assistant Extension professor, followed with a presentation on long-term estrus synchronization protocols in mature cows. Eric Bailey, an assistant professor and state beef Extension specialist, closed the first half of the talks with a discussion on backgrounding calves to increase weight during drought. “Reproduction and genetics have been a major focus at the Thompson Research Center,” Schreffler said. “There has been a lot of work with estrus synchronization protocols across the Center, and it was important to us to share that information. After a meal, Bailey continued with his drought-related discussions, with a talk on the options for feeding cows when hay is scarce. Graduate research assistants Harly Durbin and Troy Rowan followed Bailey. Durbin presented on hair shedding scores and its role in selecting cattle. Rowan discussed the Zoetis Genemax Advantage DNA test and if it works. Scott Brown, an associate Extension professor in Agricultural and Applied Economics, closed the presentations with the economic outlook for cattle. “We’ve seen a lot of positive results from the genetic work we’ve started at Thompson,” Shreffler said. “We wanted to make an effort to share that information with our attendees. For a closer look at the Thompson Research Center field day, visit: flickr.com/photos/cafnr/albums/72157701474028345.